Lunar Eclipse @ 18Gem11 December 10, 2011 9:36:19 am est White House; Hour Mars 13Vir16 in 8th house and apex of a T-Square between the Sun/Moon opposition (the eclipse) which occurs across the Will Axis (5/11) in DC. Sun/Moon = Mars: the realization of joint objectives; an urge to bring plans to fruition; the drive for fulfillment; a need to impose one's will; pushing others for quicker progress (US soldiers' withdrawal from Iraq? Mars = the military and/or police; also mercenaries but I do believe they intend to stay and continue lucrative war-profiteering--and on another level, Mars = protesters); anger; focusing on strength. With Mars in Virgo under stress of the Lunar Eclipse T-SQ, we may see deaths of males, soldiers, policemen, firefighters, etc. Will tr Mars move on to trigger the Uranus/Pluto conjunction/s of the mid-1960s as 'he' nears 16/17 Virgo? Fanaticism, violence, and injury could be results, if so. 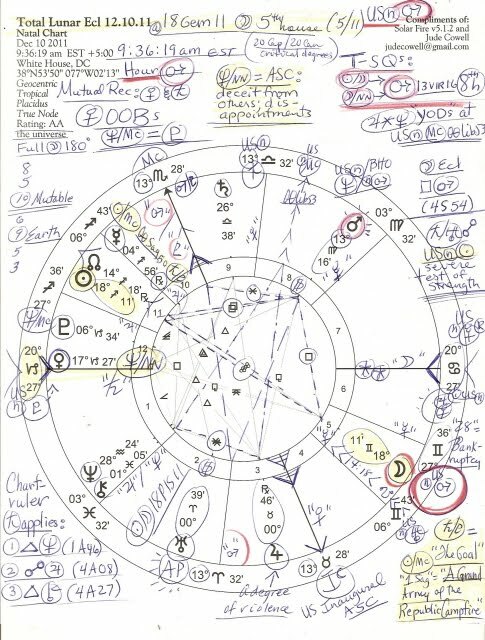 The eclipse ruler is Mercury which is retrograde (review, redress, reneg, reconsider, redo, etc) in Sagittarius, the questing sign ruled by Jupiter (also Rx, in earth/money sign Taurus, The Bull, and at a degree of violence '00-1 Tau' which is 'Hitler's Trigger degree', his natal Sun.) Jupiter in 3rd house of Communications, Short Journeys, and Neighborhoods denotes an abundance of same yet delays (Rx) may be expected especially on the level of funding; mercurial realms are affected such as transport, mobility, commerce and trade, journalism, speeches and writings, changes, plans, the younger generations (including OWS demonstrators), etc. 1. Saturn trine Neptune (1A46): spiritual development may increase, organized charities prosper, collection and settlements of financial debts may occur (EU? ); benefits may come through senior persons or entities; emphasis is on maritime activities, science, and cinematography. Scientific discoveries may be announced or furthered in some way. 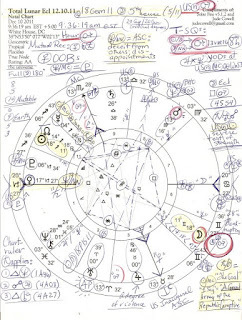 The last repetition of the 12S Saros Series occurred on July 11, 2010 @ '19Cancer' near the Twins of Gemini, Castor and Pollux--a creative pair of characters but a bit schizoid. Now as you know, lunar eclipses tend to work on more unconscious levels than solar ones and often uncover or reveal secrets and lunar-based matters long hidden. The typical eclipse 'wild card' effect may be noted with sudden realizations occurring, here related to both mercurial and martian issues. One major thing about the December 10, 2011 Lunar Eclipse is that America's natal Mars '22Gem' is 'eclipsed' by the Moon which lends support to the 'death of soldiers' or 'withdrawal--transport?--of the military', (and hopefully, no protesters will be killed though already a veteran at a rally has suffered a grievous head injury by police), so we'll see if White House promises of 'withdrawal' from Iraq come true by the end of 2011 since the involvement of US n Mars echoes the T-Square and its midpoint picture mentioned above. 11.1.11: Update: the 'eclipse' of US natal Mars on Dec 10, 2011 may also indicate secret shenanigans from the Pentagon and White House over where US troops will then be re-deployed after they 'leave' the region. Numbers will be fudged, destinations shrouded--for the West's US Imperial Bootprint is not likely to be removed from any area within the vicinity of Jerusalem, the prize. And with the Moon ruling 7th h of Partnerships (and oppositions such as Full Moons always emphasize relationships on some level--and/or stalemates, and presumably, awareness), some fluctuation and change may be seen in the 7th H area which may well include Legal Affairs and/or Open Enemies. Moon/NN = Mars: vigorous unions or associations; energetic teamwork; soliciting advice; business acquaintances join together to further mutual interests; estrangements; public activism. The involvement of the 'public contact' Moon/NN pair adds a potential for blockages to occur at port entries or exits (food? oil? troops? ), relates to possible agricultural failures, and hints at women's opinions expressed on trade, commerce, or martian topics. Well, as you can see there are more factors that could be mentioned but since this blog's comments have been sparser than usual for the last two or three weeks, I'm inclined to think that everyone has gone home--so maybe I will, too. Because for our December holidays, I don't much care for the horoscope of this military, trade, commerce, communication, union, financial cycle chart full of zeal, frustration, and delays. Plus, Mars gets awfully testy in fussy Virgo, sign of Work (employment or lack thereof), Service (military and police), and Health. Is repeal of legislation on instigator Mars's list of things to do? Probably. If President Obama signed it into law it will be, compliments of Washington obstructionists holding zealously to their over-arching ideas and higher oaths. Here Mars (males, ages 25--35, give or take a year or two) also describes Occupiers fighting against a corrupt system of laws made specially for the benefit of corporations to the exclusion and disenfranchisement of the 99%. Well, here I am closing this post yet I haven't even mentioned the ruler of the 4th H (Real Estate) and 9th H, Venus 17Cap27 rising at the *POLITICAL POWER degree of '18Cap'..."The Union Jack Flies from a British Warship"...negative expression: smug or strong-armed paternalism. Yes, we can see where jackassian paternalism has gotten the world so far. A new approach is to use the Moon/NN link and do things like the women of Yemen because democracy is a participation sport so it needs all of us to show up en masse! *The Sabian Symbols in Astrology, Marc Edmund Jones.